We're going to begin this post with a barrage of trivia. Prepare yourselves. Did you know that the fluffernutter sandwich is a)also called the liberty sandwich, b)practically the state sandwich of Massachusetts, and c)composed mainly of marshmallow creme, which was invented by one awesomely-named Archibald Query? I'd say that's pretty impressive for a sandwich consisting of three pretty simple ingredients! That sandwich (which, for the uninformed, is made using white bread, marshmallow creme, and peanut butter) was the inspiration for these cupcakes. I made peanut butter cakes using a recipe that I really like, as it yields soft and fluffy cupcakes with the perfect degree of peanut butteriness. The filling (and frosting for some) was whipped marshmallow frosting, made using egg whites and sugar. If I had had actual marshmallow creme on hand, I most definitely would've used it to fill the cupcakes; the marshmallow frosting just didn't taste as much like marshmallows as I would've liked. Since I ran out of the marshmallow frosting about halfway through, I went ahead and frosted some of the filled cupcakes with some peanut butter buttercream. Save those for the true peanut butter lovers in your herd. It seems I have a new-found respect for Massachusetts, and I hope that one day the fluffernutter sandwich actually legally becomes the official state sandwich...because that would be awesome. Preheat oven to 350 degrees. Line standard muffin tins with paper liners. Whisk dry ingredients in a large bowl. Cream the butter and sugar with a mixer until light and fluffy. Add the peanut butter. Add the eggs, one at a time, beating after each addition. Mix the sour cream and vanilla. Add the dry ingredients to the mixture and beat, being sure to scrape the sides of the bowl. Divide the batter among the muffin cups, filling each 2/3 full. Bake the cupcakes until testers inserted into centers come out clean, about 20 minutes. Let cool in tins on wire racks. To make the fluff, place egg whites, sugar, and cream of tartar in the heatproof bowl of an electric mixer. Set over a saucepan with simmering water. Whisk constantly until sugar is dissolved and whites are warm to the touch, 3 to 4 minutes. Transfer bowl to electric mixer fitted with the whisk attachment, and beat, starting on low speed, gradually increasing to high, until stiff, glossy peaks form, 5 to 7 minutes. Add vanilla, and mix until combined. Use immediately. To make the frosting, beat the butter until smooth. Add the peanut butter and beat until mixed. Add the powdered sugar a cup at a time and beat until smooth. Add vanilla and milk, if needed. To assemble, carve a cone-shaped piece out of the center of each cupcake and fill with the fluff. Continue squirting if fluff frosting is desired, or frost with the peanut butter buttercream for a different effect. If you have a state sandwich, that's a great one to have. You just can't help but smile when you say fluffernutter, can you? My herd would enjoy these peanut butter flavoured marshmallow treats. This cracked me up. And can I say I would way rather eat one of your cupcakes than the sandwich? We will be checking out everything you mentioned. (I transitioned to tv without a transition.) Plus the submarine one if only for the reason that it has Scott Speedman in it! This... I don't know if I can get behind! I love peanut butter, but the marshmallow fluff just seems a step too far. The sandwich doesn't sound good to me but the cupcakes sure do! Mouthwatering!Those cupcakes look fantastic,Grace!I don't like the sandwich, but husband does...I have to make these for him! Oh yummy. I would love these. You know the translation for fat from Polish to English would be fluffy. Ha. The quality of a Ferragamo Handbag is certainly really good. You can check if it is good or not see the material of the handbag. It is very easy for people to tell if a Ferragamo Outlet handbag is real or not by checking the hardware. Those cupcakes look light as air! I love the idea of marshmallow and peanut butter and I can't believe I haven't heard of these before!! As a true peanut butter lover, the last few would have been all mine! Fluffernutter Cupcakes!!! Oh my! I can't remember the last time I had a Fluffernutter Sandwich! I'm not even sure they would appeal to me anymore but, I certainly could devour those cupcakes in one huge bite!!! I had never heard of the fluffernutter sandwich until I was babysitting a little boy one day. He asked me to make him a sandwich then proceeded to the cabinet to grab the marshmallow creme. I spread the peanut butter on the sandwich with ease but was in horror of spreading the marshmallow creme. 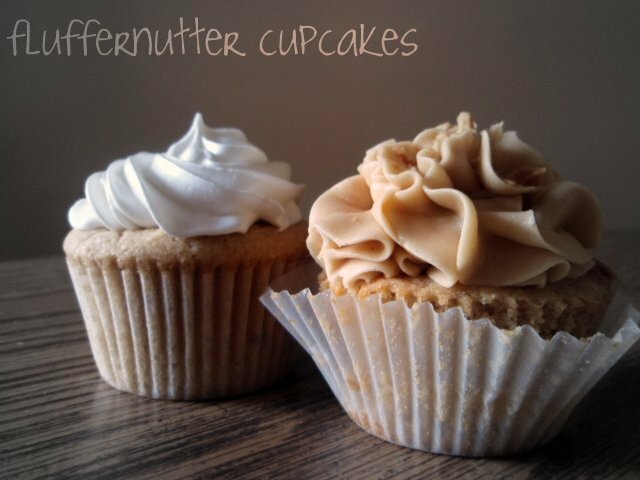 Fluffernutters are a rare and wonderful treat indeed, and your cupcakes with the peanut butter frosting on top sound perfect! First, the name Archibald is far too underused! And, so are peanut butter cupcakes in my house. I need to make some. The fluffy frosting looks delicious. You are loaded with trivia today, Grace! Great background for your inventive cupcake. And I'd much prefer eating one of your fab cupcakes than the sandwich. But I'd make sure I had enough marshmallow...I could eat it by the spoonful. Luckily, I don't have any in the house. Deliberately. A state sandwich? Now you have me thinking . . .
You are a genius, Grace. I haven't had a fluffernutter in years! Oh, how I'm longing for one now. :) These cupcakes are brilliant! That center simply looks yum, I could not resist! I have never had a fluffernutter...please dont shoot me! Those look awesome, I tried a flutternutter once and love them. The title of this post made me laugh out loud Grace! ooh yes, I like the idea of a state sandwich, that really would be awesome! And i'm a fluffernutter lover, so you are totally killing me! for anyone who hasn't tried the fluffernutter sandwich...don't knock it til you do. i thought it sounded crazy too but its AMAZING!!!!!! im sure the cupcakes will be too! And the fluffernutter just got better. Drool! You come up with the best cupcakes Girl!